Malocclusion is the formal term for crooked teeth. When you examine all the different ways numerous 3-dimensional objects can be arranged, it is not surprising that malocclusion occurs in numerous forms. Many cases of malocclusion can be corrected with clear braces from Mason Dental in Grapevine. An overbite is when the upper front teeth come down too far over the lower teeth when the mouth is closed. An underbite is the reverse —the upper front teeth close farther back than the lower front teeth. An open bite, meanwhile, refers to a bite in which the upper don’t overlap the lower teeth. This can happen on the whole bite or just one side. Many cases of malocclusion can be corrected with clear braces from Invisalign. Unlike traditional braces, they fit over the teeth like an athlete’s mouthguard. People love them because they can be removed at mealtimes and when you brush and floss. For best results they should be worn at least twenty-two hours a day. 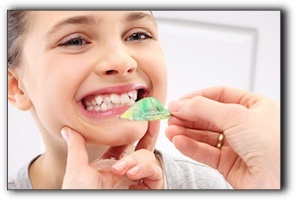 If you or your child has crooked teeth or a misaligned bite, we invite you to schedule a thorough examination promptly. At Mason Dental in Grapevine, we offer Invisalign clear braces, as well as general dentistry. Schedule an appointment today.